Former World Champion Viswanathan Anand claimed a convincing victory in the FIDE World Candidates Tournament 2014 to challenge the reigning World Champion Magnus Carlsen to another match in November. Anand made a draw against Sergey Karjakin in the 13th round of the tournament to secure a clear first place with a round to spare. Anand held the world title from 2007 to 2013, when he lost a match against Carlsen in Chennai, India. FIDE President Kirsan Ilyumzhinov said in an interview with Chessdom that there are “several proposals to organize the FIDE World Chess Championship 2014″. 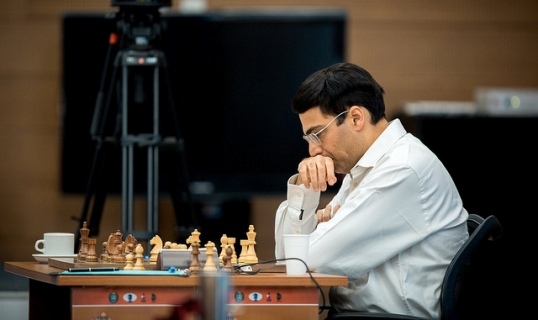 Viswanathan Anand will have another shot at the World Chess Championship title after winning the Candidates Tournament 2014 in Khanty-Mansiysk, Russia. In round 13 Anand held a draw against Sergey Karjakin to take his score to 8 points and secure clear first place with one round to go. Anand is set to play a match with World Champion Magnus Carlsen in November. The hosting city should be announced soon. 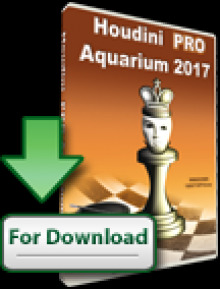 In the other games Dmitry Andreikin defeated Levon Aronian and Vladimir Kramnik won against Veselin Topalov. Peter Svidler and Shakhriyar Mamedyarov split the point. Anand is first with 8 points, point and a half ahead of the large group of players on shared second place – Andreikin, Kramnik, Aronian, Mamedyarov and Karjakin. Svidler is 7th with 6 points, while Topalov is last with 5,5 points. 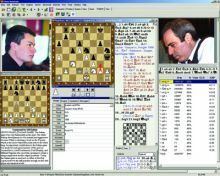 Shakhriyar Mamedyarov remained consistent and chose once again the Sicilian Naidorf. Peter Svidler answered with 6.Be3, the line in which he has huge practical experience. The first critical junction was on move 16 when black played Nd4 instead of Grischuk’s Nce5. Next he offered exchange of the queens. More pieces were traded soon and a rook endgame was reached around move 25. Black had the doubled f-pawns. World Champion Magnus Carlsen tuned into live commentary with GM Peter Heine Nielsen and said that white can keep pressing for a long time without any risk. Svidler tried for something more until the time control, but then he agreed to a draw. Levon Aronian played another very original opening, defending against the Trompowski employed by Dmitry Andreikin. After only ten moves of play black’s pawn structure looked awful, but he still tried to stir trouble on white’s long castle and advanced pawns. White decided to trade the queens and go into a roughly equal endgame. He offered an exchange for advanced passed pawn, but black snubbed the offer because the eventual result was likely to be a draw. Aronian needed a win to stay in contention for the first place. Andreikin skillfully took advantage of the poor placement of black bishop to win a pawn and proceed to the double rook ending. He converted into full point on move 44. Vladimir Kramnik and Veselin Topalov tested the Semi-Slav Moscow variation. Again Topalov was first to insert a new move, by playing the speculative 10…c5. Kramnik cemented the development advantage with an excellent 14.Bb5, which prevents black knight from coming into play. Magnus Carlsen also praised this move in his live commentary. Black somehow untangled his pieces but white already had the action going on the kingside. However, after a couple of inaccurate moves, white lost all of his advantage and even started looking suspicious because black had the pair of bishops. The resulting endgame was sharp and unclear. It was extremely difficult to find the most precise moves – only deeper analysis can tell. Topalov was the last to make a mistake, when he allowed white rook to reach the back rank and claim a bishop. Kramnik quickly wrapped up the game. 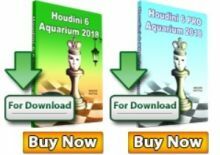 Sergey Karjakin was fully charged to fight in the game versus Viswanathan Anand, having in mind that only a victory would have given him the chance to win the first place and match against the World Champion Magnus Carlsen. White played a modest yet flexible setup with fianchetto on b2. Black replied with the principled strike in the center c5, but was soon left with a backward c6-pawn. Karjakin won this pawn but the queens got exchanged and it looked like black had a good compensation for the material. Anand’s idea to trade the light-squared bishops with 17…Bd7 was criticized by Magnus Carlsen. The reigning World Champion had a good hunch, as black soon came under pressure on the queenside. Anand made a huge decision to give two pieces for a rook and pawn. The material favored white, but all pawns were on one side of the board and white pieces were poorly coordinated. The Grandmasters who commented the game on Twitter believed that black had better chance to draw than white to win. Anand succeeded in setting a fortress, and despite the huge effort Karjakin simply couldn’t find a way through. With this draw Vishy Anand is set to challenge Magnus Carlsen for the title of FIDE World Chess Champion in November 2014.